In 2012, Jordan Weisman and his team at Harebrained Schemes asked for $400,000 on Kickstarter to develop a new tactical RPG set in Weisman’s cyberpunk-fantasy Shadowrun universe. They received almost $2 million. With that kind of overachievement, hopes were high for Shadowrun Returns, which released last week on PC. Like other successfully-Kickstarted titles—and like the early-90s Shadowrun games on SNES and Sega Genesis—Shadowrun Returns promises a bit more than it can deliver. But it’s a stylish, engrossing role-playing adventure that feels very much like the pen-and-paper storytelling system it’s based on. The Shadowrun universe takes a bit of getting used to. The setting is a bizarre collision of William Gibson and Warhammer, with cyber-augmented elf mages jacking into the Matrix to steal nuyen from megacorps. If you understood any of the preceding sentence, you’re probably in the game’s target market. If not, you’ll have to trust me that it’s still a fun playground to inhabit. And it does, blessedly, have a sense of humor about itself. 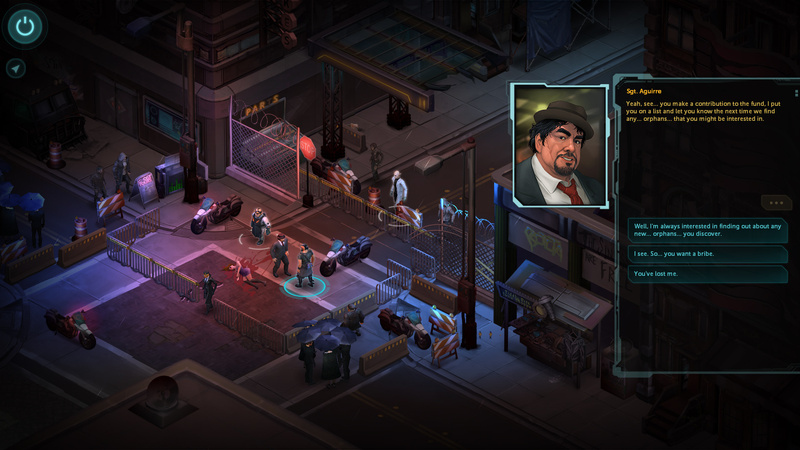 Like its predecessors, Shadowrun Returns is set in mid-21st century Seattle. You play a shadowrunner, a mercenary hired to perform shady work in a world full of shady characters. The game’s campaign, “The Dead Man’s Switch,” opens with you receiving a recorded message from a recently-deceased friend, Sam Watts, who charges you with solving his murder. Throughout the next 10-12 hours, you’ll unravel a mystery that involves an organ-harvesting serial killer, a religious cult, a giant corporate conglomerate, and poison-spewing spectral insects. In other words, pretty standard stuff. 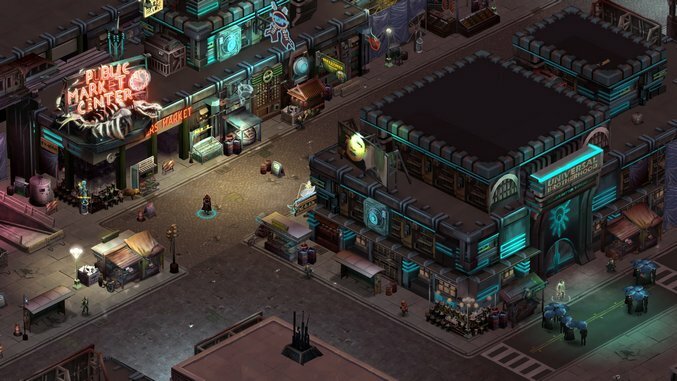 Although the environments of Shadowrun Returns are gorgeous, dense splashes of colorful objects heavy on atmosphere, the game places a priority on text. Between the interstitial narrative bridges and the frequent dialogue, there’s a lot of reading to be done—which, when the writing is this engaging, isn’t a bad thing. Particularly impressive are the multiple response options for your character, which are written cleverly enough to allow space for great characterization and fun interaction with NPCs, but are not tied to a binary “good/evil points” system a la Mass Effect. As in a pen-and-paper RPG, you’ll guide your character through a series of connected “scenes,” which generally run between 20-40 minutes each. Many of these are entirely devoted to dialogue, but most involve at least some tactical combat. 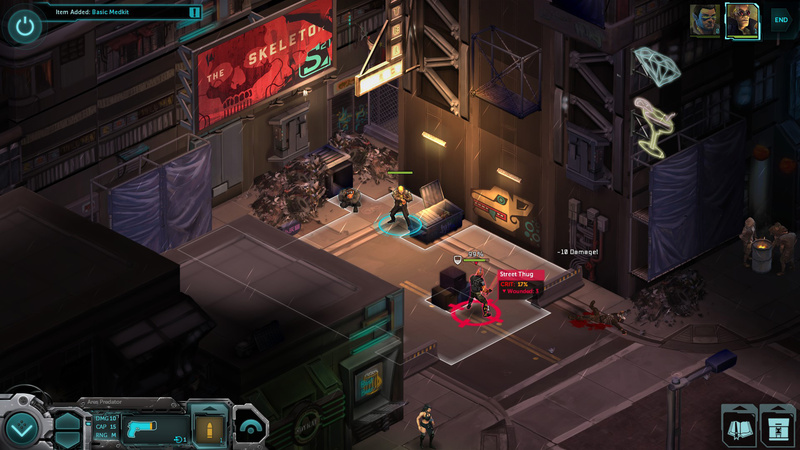 Players who enjoyed last year’s XCOM: Enemy Unknown or other isometric, turn-based titles like the first two Fallout games will find the combat system familiar. You and your squadmates each have a given number of Action Points to spend on movement, attacking, and spellcasting before it’s the enemy’s turn. The system works as advertised most of the time, although not being able to rotate the camera can make for frustrating missed clicks, and the cover system is graphically similar but less mechanically clear than XCOM’s. While there’s a multitude of combat options—spellcasting, summoning and remote-controlled drones among them—you may find yourself relying on simple gunshots more often than not. This can feel a bit like having a chest full of toys but only being able to play with one at a time. The promise of the possibilities is more exciting than the reality. That said, the user interface is very intuitive, giving you the information you need to plan your tactics. Most battles are satisfying, tense encounters where you’re forced to adapt on the fly. The combat segments that take place in the Matrix, the virtual-reality battleground your character will “deck” into, are less successful; it’s less clear how combat powers work, and you end up having to do a lot of tedious backtracking. Of course, in both settings, the dice rolls that govern your success often foul up even the best-laid plans. Randomness is a harsh mistress. The massive array of specialization options for your characters should help offset that. But in my experience, the opposite was true: even using a pre-built class, it was overwhelming trying to distribute upgrade points (“karma”) effectively. Shadowrun Returns’ campaign contains very few side missions to help you level up and earn cash, and while you can re-spec and resupply your character between encounters, the pacing of upgrades feels a bit uneven. The final series of encounters doesn’t even permit resupplying. Like many a final act in game campaigns, Shadowrun Returns breaks its own rules near the finish line. A more serious offense is the autosave system, which is something of an oddity in a tactical RPG. The game autosaves between scenes, so it is somewhat predictable, but not predictable enough to be useful when, say, real life intrudes. Worse, the lack of manual saves means failing a mission (or simply wanting to redo a segment) can cost you half an hour or more of replaying. My squad barely squeaked through the final battle, using every last item and spell in its arsenal. I can only imagine how frustrating it is for players who didn’t gear up as much beforehand, or who got worse rolls during the battle, to have to roll back all that progress. But it’s important to keep in mind that “The Dead Man’s Switch” is only the included campaign. From the start, Shadowrun Returns was billed as a storytelling engine—not only an RPG adventure in and of itself, but a system for creating your own adventures. The truly exciting feature of Shadowrun Returns, and why it will probably deserve another review a year from now, is the included campaign editor tools. Given Jordan Weisman’s experience as creator of the pen-and-paper Shadowrun, it makes sense that he’d want Shadowrun Returns to also serve as a mechanism for players to tell their own stories. Within a day of the game’s release on Steam, users had already posted tutorials and sample assets for aspiring GMs on the Steam Workshop. It’s hard to think the Workshop won’t be flooded with player-generated content (some of it very good, if Skyrim is any indication) within a few months. This flexibility lends Shadowrun Returns a value proposition other games desperately need. There are many more cyberpunk-fantasy adventures to come.